Laptops and phones; offices and homes... these days everyone’s web chatting. With all the different cameras and computers out there, you’d think that there would be more visual variety though. Instead, what you see is what you get, and the feed from nearly every webcam looks the same. What if you could change all that though? What if you could alter the way your images appear in real-time while chatting or giving a presentation? Now you can. 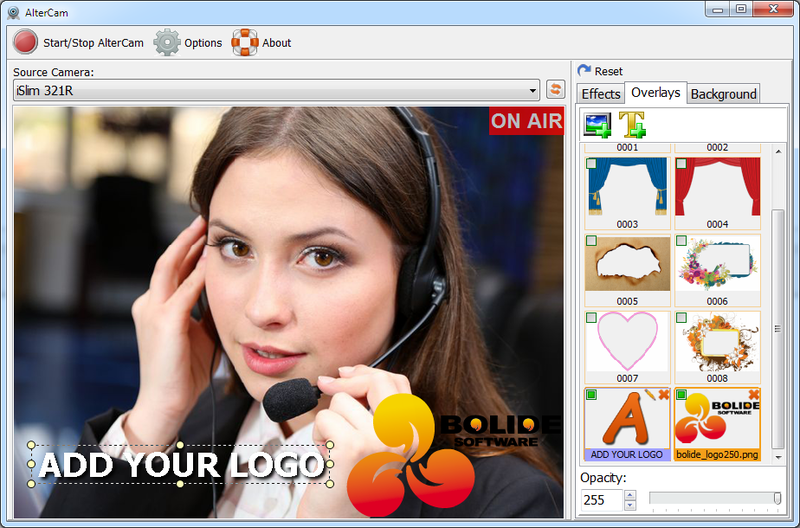 AlterCam lets you create, alter and manage video effects before and during Live feeds. Loaded with cool customization options, AlterCam is the perfect solution for users that are looking to create professional web-based presentations. Whether you’re addressing a large conference or putting on a small webinar AlterCam lets you take control of the look and feel of your video feed. Nothing says we mean business like a prominently featured company logo. By including a logo in your video feed, you’ll not only add to the professional feel of your broadcasts, but it’s also a classy move. 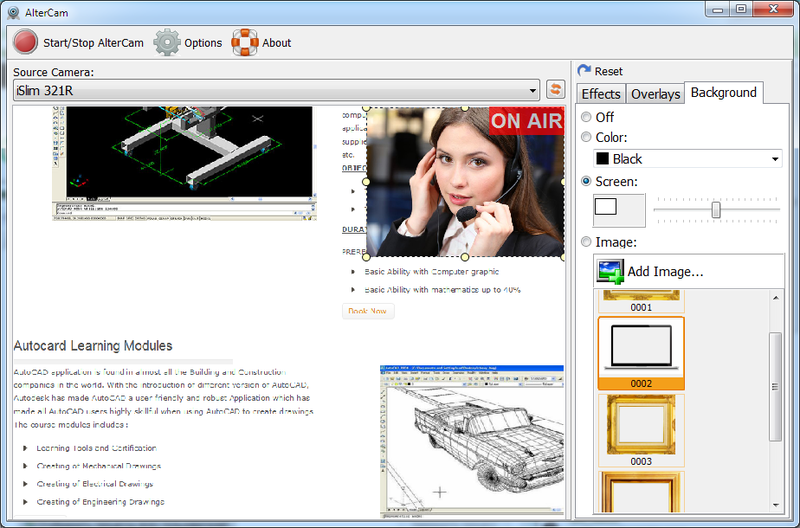 AlterCam lets users position their choice of graphics over or under any existing webcam feed. Whatever you want your logo to be, and wherever you want it to sit on the screen, we’ve got you covered! Text overlays can come in a variety of forms and used in many ways. With AlterCam you can add all sorts of content over top of your standard video feed. Upload a custom border, or choose from the graphics that we’ve included to frame your viewing window. Users also have the option of adding text to their feeds. This can be incredibly useful when, for example, you’d like to include language translations during meetings with clients that might not otherwise understand what you’re saying. AlterCam includes an amazingly useful feature that lets you not only reduce the size of your webcam video display, but also to place that display anywhere you want on your screen. By resizing and repositioning your webcam window, you reveal everything else that is happening on your desktop. An excellent option when you’d like to show and tell during a meeting. Instead of holding something up in the picture, or having to send attachments – simply display what you’re referring to on your desktop. Check our webcam software comparison chart if you are still in doubt. You should try it now Download FREE TRIAL!